Aladdin is a magic carpet ride extraordinaire. 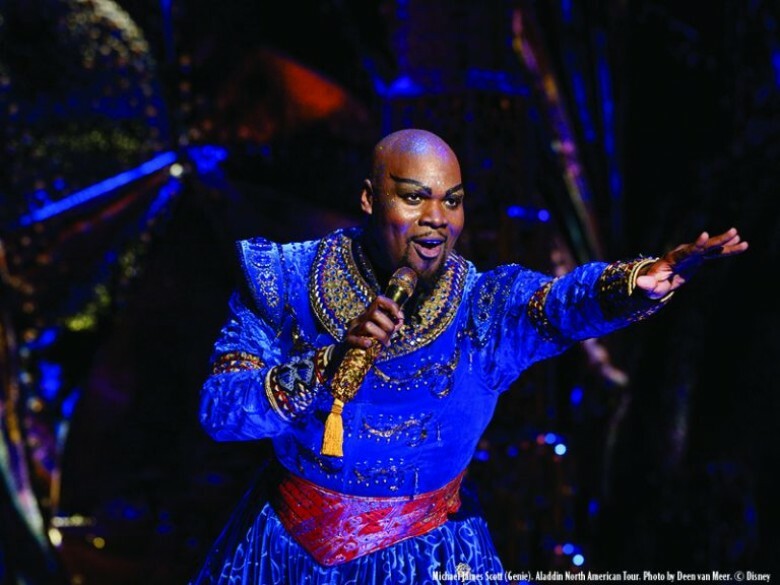 The Disney production at Shea’s Performing Arts Center until August 19th dazzles the eye and delights the ear. It is opulence from beginning to end. And, it has a heart. 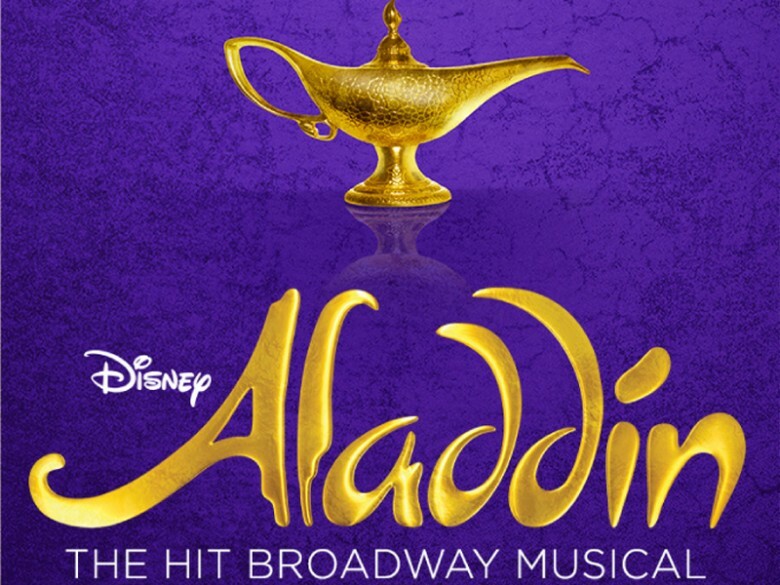 There is no doubt that a very talented creative team with 20 Tony awards among them, plus a very large Disney budget, are responsible for this feel-good, highly energetic, glittering production based on the 1992 movie. And I do mean glittering. There are 8,644 Swarovski rhinestones on each man’s gold finale costume in Act One's “Friend Like Me.” And that’s just a handful of the 337 costumes in the show. The actors sparkle and shine throughout. Even the Genie has sparkles on his bald head. Played with great panache by Michael James Scott, the Genie steals the show. Mr. Scott laughs at himself and at his audience, cajoles us, sings and skips and dances. His rapid patter is hilarious throughout, quick and witty, with local references and eye rolling looks to the audience. His presence on the stage would light it up even without the 284 lights employed throughout the show. He is marvelous. The special effects—84 of them—are a blast, startling, and at times awesome. When Aladdin takes Jasmine on a magic carpet ride above the city of Agrabah, with the moon in the background and the stars shimmering, there is magic in the air, indeed. There are no discernable wires moving that conveyance along. It is enchanting. The Cave of Wonders is truly a wonder, filled with gold and dazzling jewels. Aladdin is sent there to find the magic lantern by the evil vizier Jafar, played with just the proper amount of oily villainy by Jonathon Weir. When Aladdin rubs the lantern, the Genie pops out of a huge bejeweled box and we are treated to the show-stopping “Friend Like Me,” an amazing turn by Mr. Scott that had the audience on its feet, with the ensemble in glittering costume after glittering costume singing and tap dancing in what can only be an homage to Busby Berkeley. Whew! My companion for the evening, my 12-year-old nephew, was taken with the sets. He particularly liked the marketplace with the city buildings around. He said that it felt real to him, with the colors of the sky changing from day to night. Lest you think this is a show for children, adults in the audience were equally delighted by this warm-hearted, joyful spectacle. Iago (Jay Paranda), the parrot-like comical foil to Jafar, said it best: “Go to your happy place.” The city of Agrabah is surely the happiest place in town right now.